← Here’s to a P2P Popping New Year 2014! Hotel Luna Convento’s Saracen Tower is on the right. We stayed at this magnificent hotel for four days of our honeymoon. My husband Angelo and I were married in 1996 and for our honeymoon it was a “no brainer” that we would go to Italy, Angelo’s birthplace. This would be my second trip abroad, but my first independent trip. We used a travel agent to book the flights, hotels, and car. My husband spoke Italian and had been to Italy many times himself, so as hard as it is for me to believe now, I didn’t do any trip research. 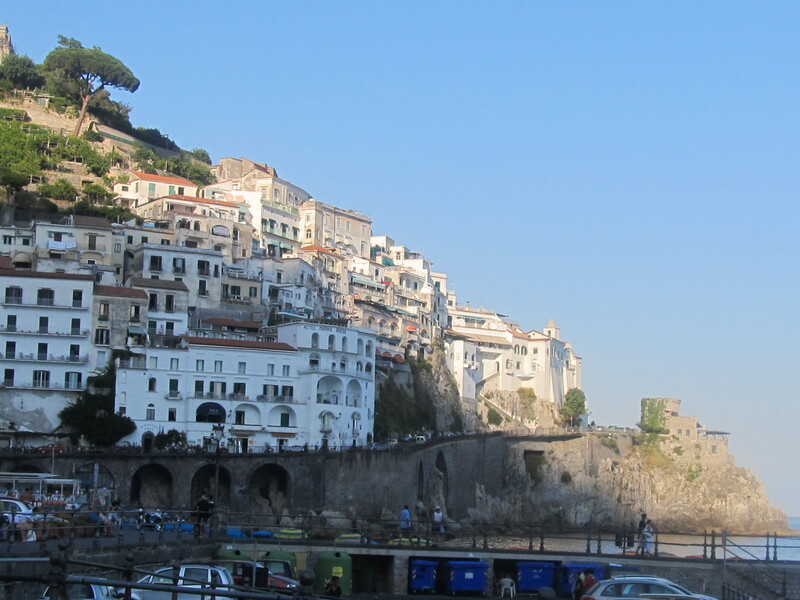 The two week trip entailed the typical, yet unquestionably, deserving tourist destinations, Venice, Florence, and Rome, followed by the glorious Amafi Coast. Happily, in retrospect, I can tell you that it really was a wonderful trip and honeymoon, despite the fact that it rained 13 1/2 of the 14 days, and that the honeymoon got off to a really rough start. It’s that rough start that still has us laughing 17 years later. We arranged the trip with the travel agent well in advance, booking the departure for the day after the wedding. In retrospect, we realized that that was a big mistake. It would have been smarter to give ourselves a day to recover from the wonderful yet exhausting whirlwind that precedes and ends with the wedding. Unfortunately, we did not think of that until the morning after the wedding, the morning of the scheduled departure. So, needless to say, we both got very little sleep before the flight, and because we were still very wired, we got little to no sleep on the flight over from New York to Italy. The trip was long due to a layover in Rome on route to Venice Airport, then a boat from the airport to Venice proper. After what seemed like an eternity, we arrived in Venice around 15:00 (3pm) their time. We decided we should stay awake at least until early evening to acclimate to the new time zone; so we went out and walked around the wonderful city for several hours. When we could not stay awake any longer we returned to our tiny hotel room on the fourth floor. It was so tiny that the cute little balcony overlooking a pretty little canal was only about 3 feet from the end of our bed. While November, the weather was still warm and the room a bit stuffy; so we decided it was okay to leave the heavy shutters, the only door to the balcony, open. I was a little nervous about leaving us exposed like that, but we were on the fourth floor, so I let it go (or I presumed I did.) By the time we went to sleep, we had been awake for, let’s just say, a crazy amount of time, more like days than hours. Apparently, it was not a strange man in the room; just a man, the man I just married. He had also heard the banging of the shutter, and had gotten up to close the shutter. This incident scared both of us more than I can explain and left us both feeling rattled for days after. We didn’t know whether to laugh or cry about it. The good news is, once our nerves settled down, we laughed, and we are still laughing about it seventeen years later. I like to tease Angelo that it is a testament to his love for me that he did not ask for an immediate annulment after witnessing my terrifying behavior. This story, in a very abbreviated version, was published by Budget Travel magazine as a selected True Stories submission; unfortunately, not a prize winning one! 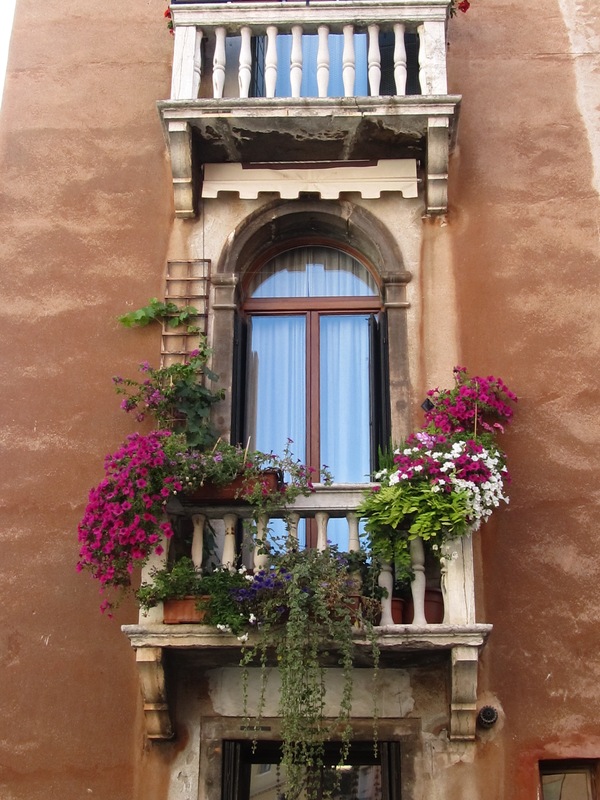 This entry was posted in My Travel & Culture News and tagged Italy. Bookmark the permalink. Aww, a funny story to laugh about and share together many years later! It really was and we really do!